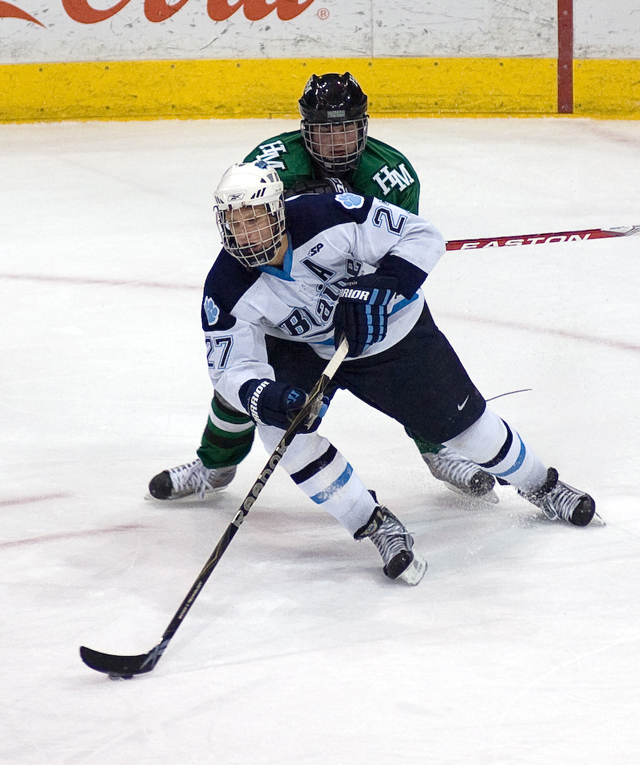 Scheid nets hat trick as Blaine beats Hill-Murray in Gold quarters. 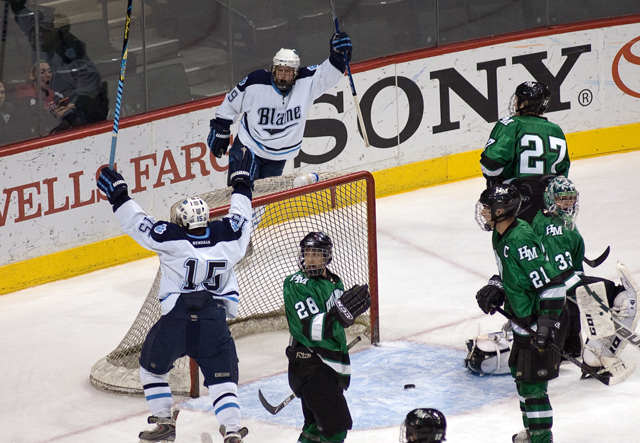 After two tough losses to ranked teams in the past week, Blaine wanted to come out fast against Hill-Murray in the quarterfinals of the Schwan Cup Gold division Monday night at the Xcel Energy Center. 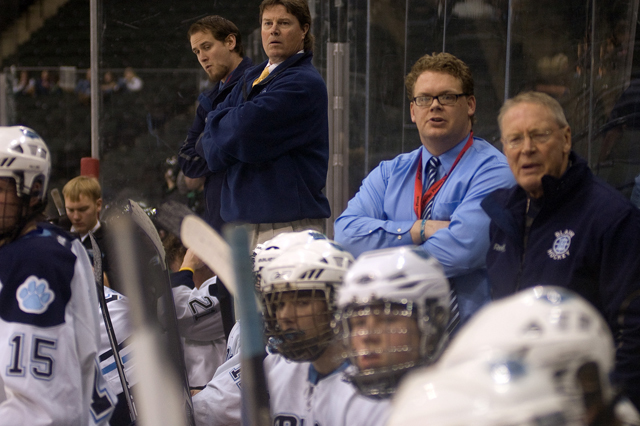 The Bengals raced out to a 4-1 lead after one period on the shocked Pioneers, then held on en route to a 6-4 victory. 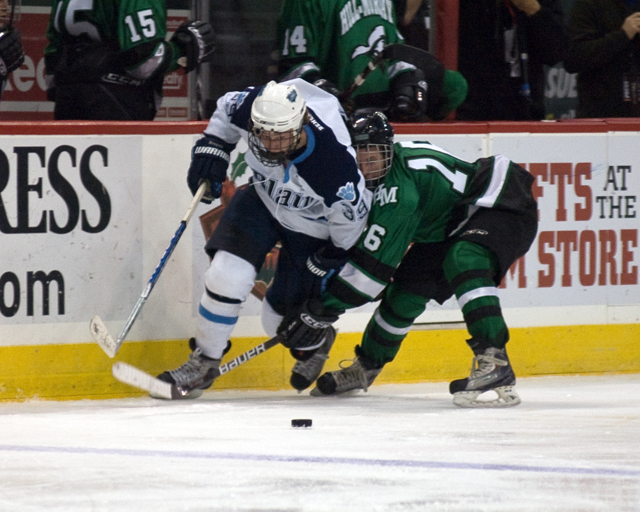 Senior Eric Scheid, who admitted he’d been snake-bitten since the season’s start, got Blaine on the board with two goals 59 seconds apart midway through the first period. “I’ve been struggling to score lately and can’t find the back of the net, but tonight was a big confidence booster,” Scheid said. 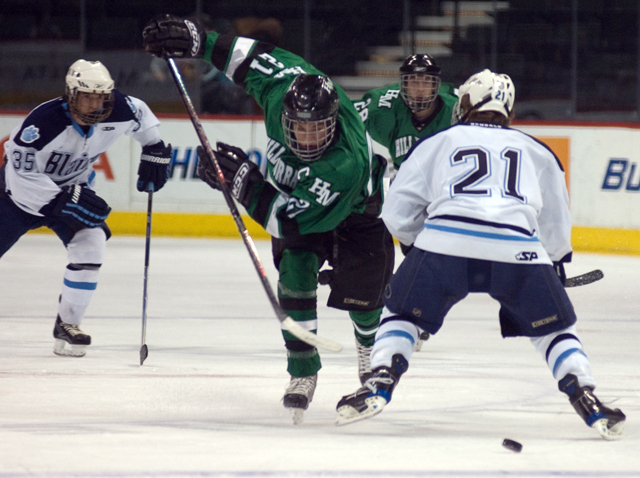 After Hill-Murray’s David Bruchu brought the Pioneers within a goal, the Bengals exploded for two more quick ones to seemingly put the game out of reach. Jonny Brodzinski hammered in a goal at the 11:38 mark, then Nick Bjugstad tapped in a terrific short-handed, behind-the-back pass from Gavin Tufte at 12:57. 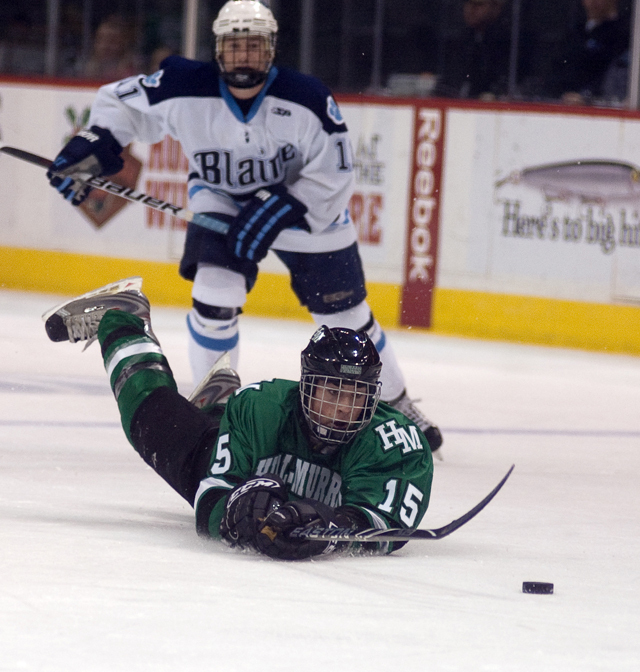 Hill-Murray, which had allowed only 10 goals in its first eight games, found itself in an unfamiliar position. But the Pioneers didn’t cave. 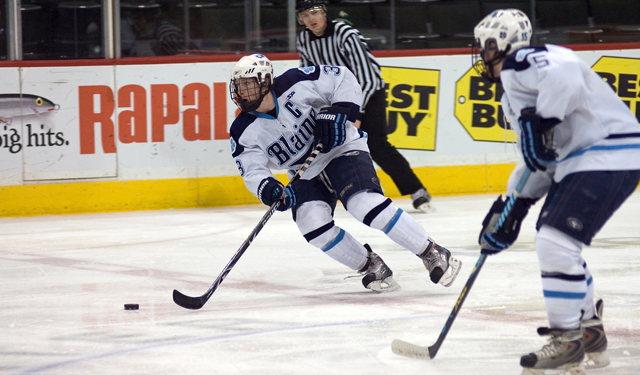 They pulled within 4-3 on second-period goals from Charlie Sampair and Ben Bahe, but Blaine’s Gunnar Meger stopped the rally with a goal late in the second period. Kevin Becker brought the Pioneers back within a goal with just 3:32 to play and a frenetic finish ensued. 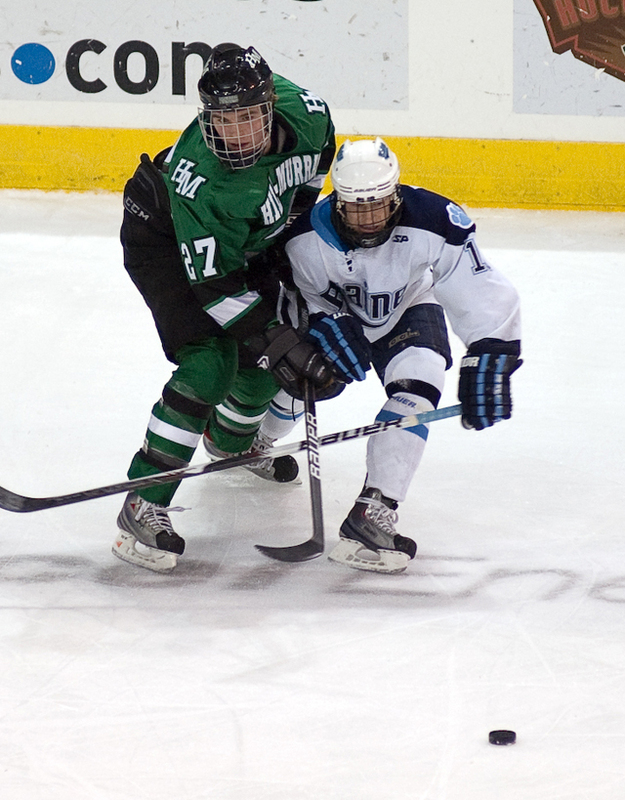 Hill-Murray pulled goaltender Tim Shaughnessy and continued to pressure Blaine goaltender Danny Harper. “We told these guys the game wasn’t over. We still needed to play,” Aus admitted. 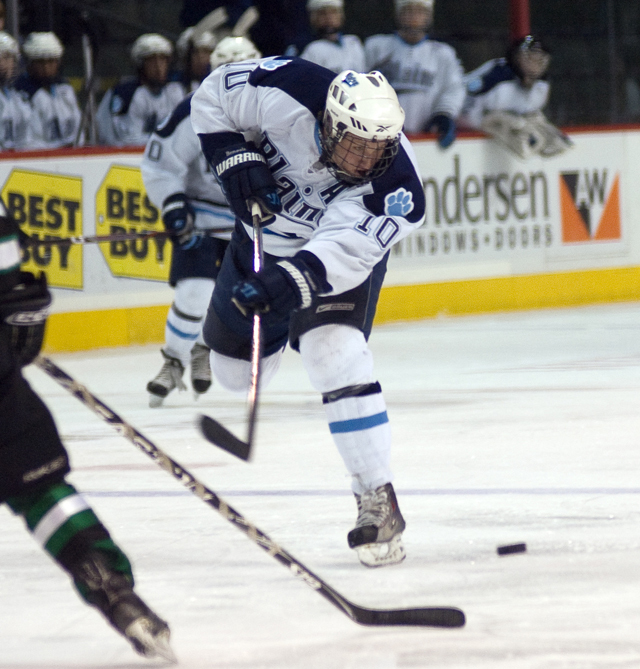 The victory wasn’t sealed until Scheid completed his hat trick with an empty netter with nine seconds remaining. Harper made 28 saves on 32 shots for the victory. 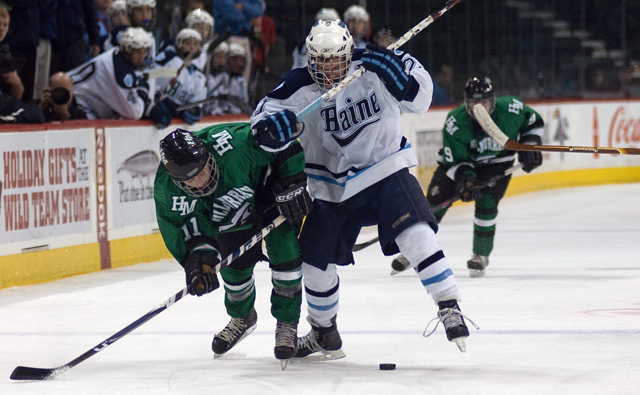 Shaughnessy had 15 saves for Hill-Murray. 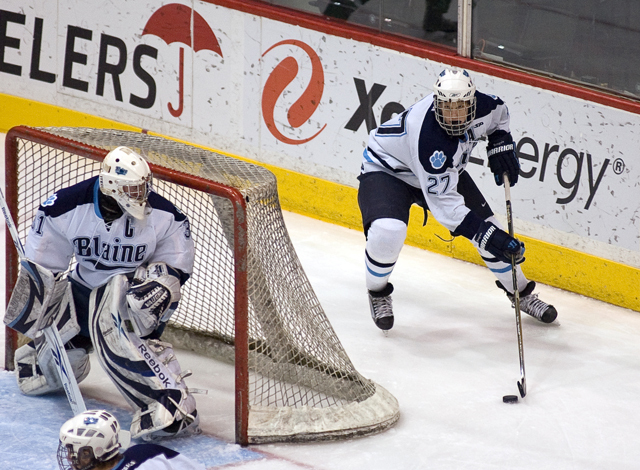 The Blaine senior winger got the Bengals off to a great start with the game's first two goals, just 59 seconds apart midway though the first period. He then sealed the victory -- and his hat trick -- with an empty-netter. 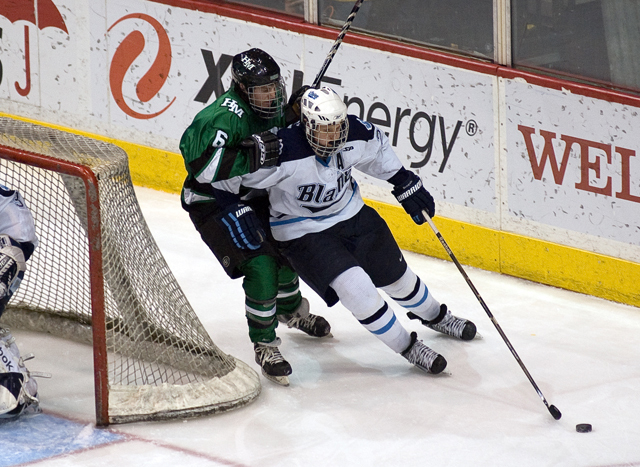 Blaine's senior netminder may have looked better in recent games, but when Hill-Murray came on in the second and third periods, Harper kept the Bengals in the lead. He finished with 28 saves on 32 shots. 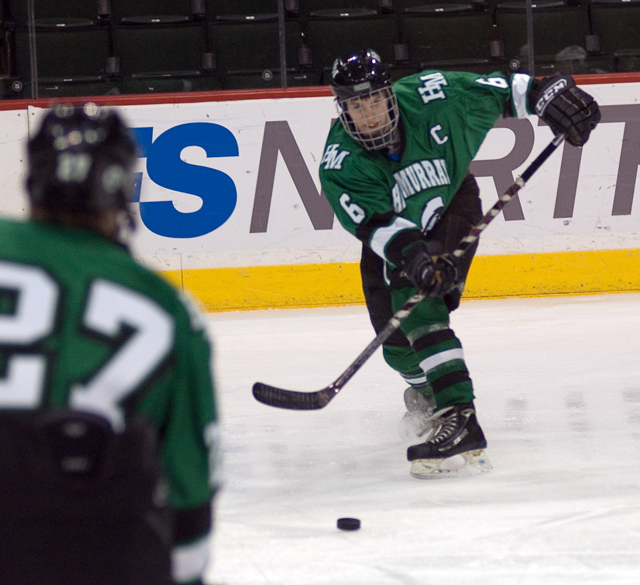 Casto, a Hill-Murray senior defenseman, helped stabilize the Pioneers after a rough start. 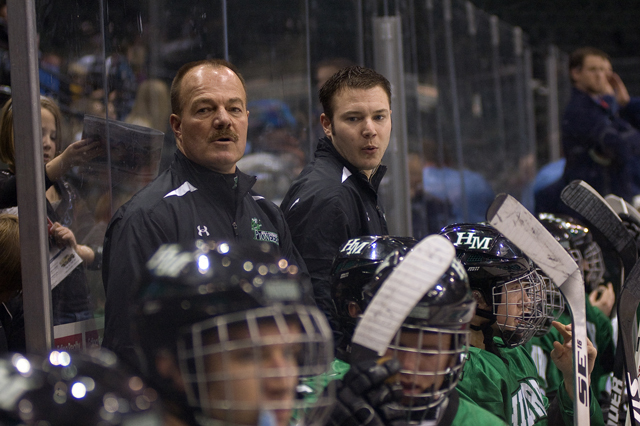 He assisted on two goals and was a calming influence as Hill-Murray rallied to within one goal after trailing 4-1 in the first period.